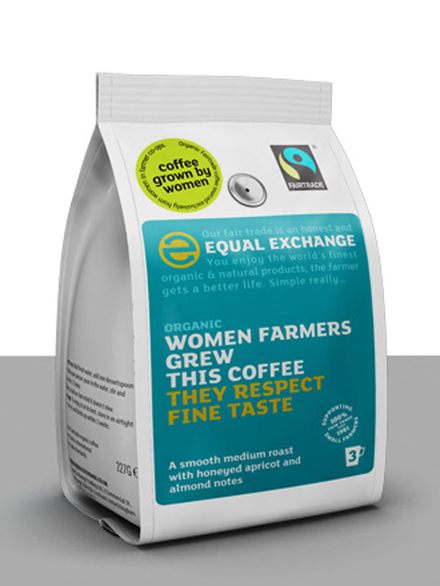 Grown by Women Ground Coffee, Organic 227g (Equal Exchange) - HealthySupplies.co.uk. Buy Online. For use with a coffee infuser or cafetiere. Equal Exchange purchase from the same farmer co-operatives year in, year out. The security of receiving a consistently fair price for their hard work enables them to reinvest in their farms. This coffee is grown by women farmers, allowing them to build a future. It is a smooth, medium roast with honeyed apricots and almond notes. Organic • Vegetarian • Fairtrade.